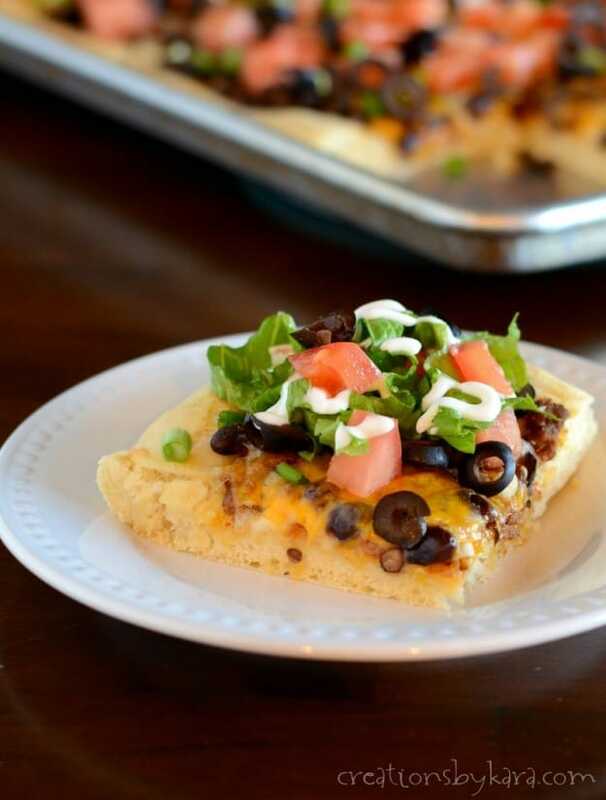 Taco Pizza- Two favorite classic recipes combined to make a new dinner idea that is sure to be a hit with adults and kids alike! 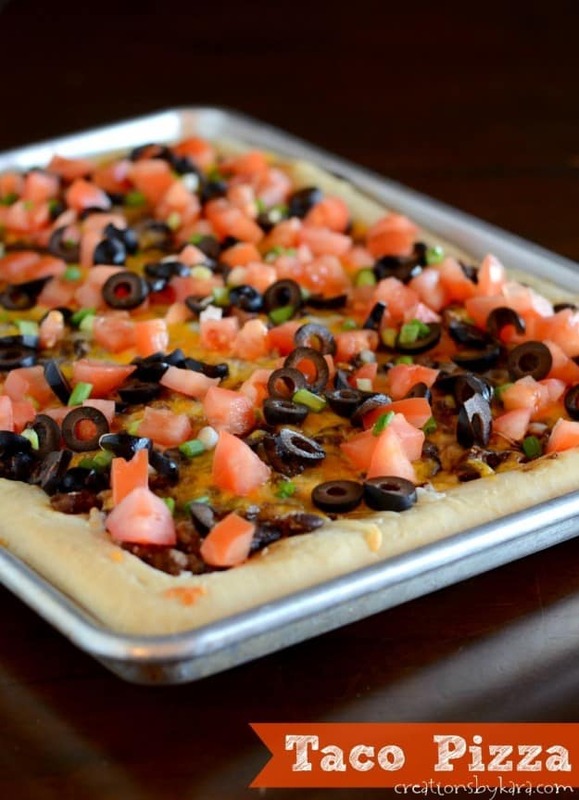 I was asked to come up with two recipes using olives, and I immediately thought of Taco Pizza. I tried a similar recipe a few years ago, but it had refried beans, and my family didn’t love it. So I totally changed it up, and came up with my own recipe for Taco Pizza. This time around it was a huge hit! The handheld ease of pizza with the yummy favors of a taco is of course going to be a hit with kids. But my husband and I loved it too! If you’re stuck in a rut serving the same kid friendly meals every week, shake things up a little and give this recipe a try! I served it with shredded lettuce, extra tomatoes, extra olives, and some sour cream. I loved the combination of the hot pizza and the cool toppings. So good! Brown the ground beef in a large skillet. Drain off any fat. Add taco seasoning, water, and black beans. Simmer uncovered for 5-10 minutes. I mixture gets too dry, add more water. Meanwhile, press the pizza crust into two greased pizza pans or one large jelly roll pan. Prick all over with a fork, and bake in a preheated oven at 400° for 10 minutes. Remove from the oven and spread the meat mixture evenly over the crust. Sprinkle cheeses over the meat mix and bake for another 5-6 minutes, or till cheese is melted. Remove from oven and add the diced tomatoes, olives, and green onions. (Reserve some of the tomatoes and olives for garnish.) Bake for 2-3 more minutes. Cut into slices and garnish with lettuce, tomatoes, olives, and sour cream. For my next recipe, I used pimento stuffed green olives to come up with a super easy appetizer. Just mix a few ingredients together, fill the celery, and you’re done! You could easily substitute black olives for the green ones if that’s what your family prefers. I know my kids go crazy for the black olives, but won’t touch the green ones. So use whatever works for you! The combination of textures and flavors is great either way. Beat cream cheese and sour cream till smooth. Stir in diced green olives, salt, green onions, and toasted almonds. Cover and chill for at least 30 minutes to blend flavors. 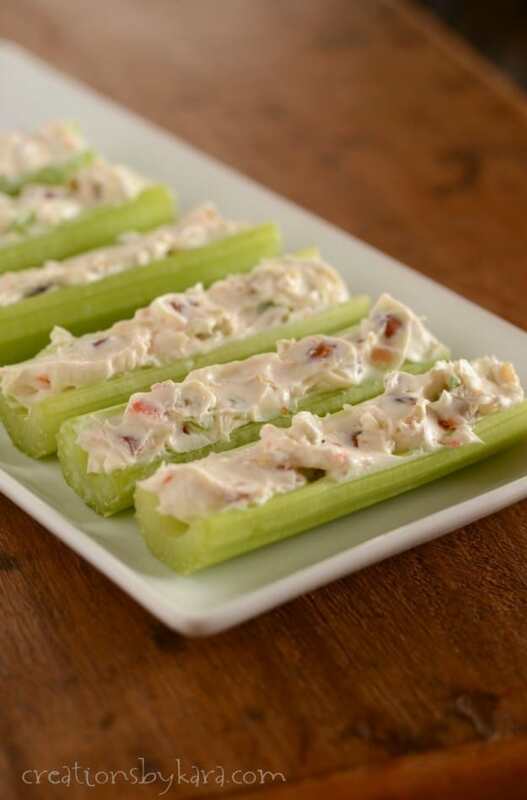 Cut celery stalks into pieces 3-4″ long. Stuff with cheese mixture. Refrigerate leftovers. This looks yummy! I was actually just thinking about California Pizza Kitchens taco pizza last night and how much I wish I had a similar recipe… now I have one! Thanks! I’ve never had taco pizza at California Pizza Kitchens. You’ll have to let me know how it compares!